Home What's on I say I On I-Saying in Dance and Performance. I say I On I-Saying in Dance and Performance. 14 - 24 September 2005. This two-week artistic programme is devoted to I-narration in contemporary dance and performance. Opening with works by Lebanese director and author Rabih Mrou and the Netherlands performer Robert Steijn, the programme also includes the Austrian collective Theater im Bahnhof, two solos by the Belgian choreographer Michael Laub and a co-production by Unit F fashion bureau and Tanzquartier Wien. 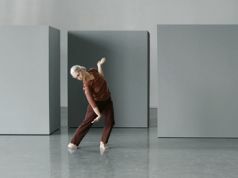 A two-day symposium runs in parallel to the dance performances, following the opening party. Address Tanzquartier Wien at the Museumsquartier, Museumsplatz 1, 1070 Vienna, Closest metro (U-Bahn): Museumsquartier (U2). Tel: +4315813591, tanzquartier@tqw.at. Tanzquartier Wien at the Museumsquartier, Museumsplatz 1, 1070 Vienna, Closest metro (U-Bahn): Museumsquartier (U2). Tel: +4315813591, tanzquartier@tqw.at.